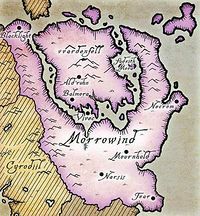 During the Oblivion Crisis, rumors that the city had been overrun by Daedra spread throughout Tamriel. According to an annal of the Crisis, ancient rituals were performed to awaken Skar, the dread emperor crab, but the armies of Oblivion prevailed and the entire city was destroyed. [UOL 1] The town was apparently being rebuilt when the eruption of the Red Mountain during the Red Year once again wreaked mass devastation. 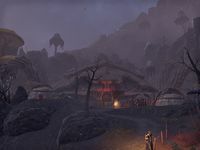 Buckmoth Legion Fort was the Imperial Legion outpost located due south of Ald'ruhn and west of the Ramimilk shrine, on the road to Ghostgate. 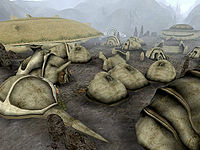 For game-specific information, see the Morrowind Ald'ruhn and Buckmoth Legion Fort articles, as well as the ESO article. This page was last modified on 25 February 2019, at 01:28.